Not long after the launch of the latest most updated model of premium MPV Toyota Vellfire recently, custom special parts made by Toyota Modellista International for the luxury MPV has now been sticking out to the public. As always, the brand-new look offered from Modellista will cultivate the potential of elegant nuance and luxury in the physical car that they 'enter' to one level above it. 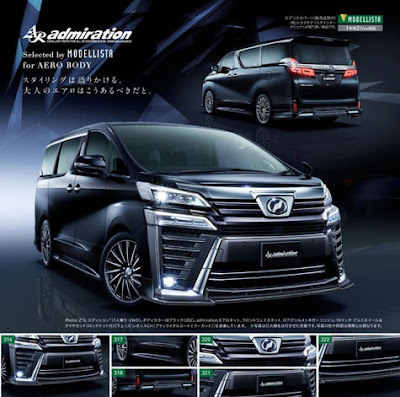 Among the body kit offerings, such as those listed on Modellista's official page, there is a special kit titled 'Admiration' kit that is specially spiked with chrome accents in the center piece front bumper and housing fog lamps. 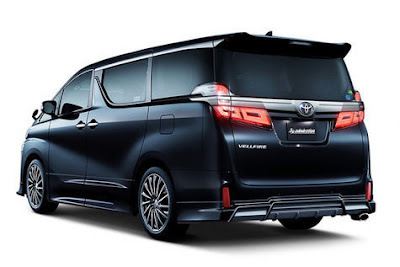 The new Vellfire Admiration design has a new elegant decoration in the form of Aero Tourer Kit (full bumper type) as an additional spice of luxury aura and Aero Kit in charge of solid and 'powerful' impression from the outer shell. While the fascia with exclusive front grille and new illumination lighting are also available for those who crave the exterior dynamics that is more beautiful than the new Vellfire facelift.